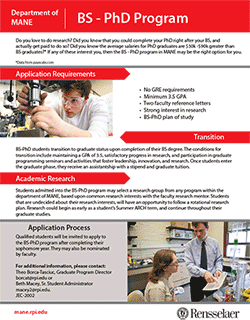 The MANE Department offers a BS-PhD Program for Rensselaer undergraduate students with a passion for research. In this unique program, students are able to conduct research during their undergraduate studies, begin their PhD immediately after receiving their BS degree, and get paid to do so. As admitted BS-PhD students transition to graduate status, they will participate in graduate programming seminars and activities that foster leadership, innovation, and research. Upon completion of their BS degree and entering the graduate phase, they may receive an assistantship with a stipend and graduate tuition. Get a jump start on your research. Complete your PhD right after your BS, and actually get paid to do so. All Sophomores and Juniors with a 3.5 GPA or higher will receive an invitation to apply. Students may also be recommended by faculty. Must graduate with your B.S. degree within eight semesters or less. For additional information about the MANE BS-PhD program, contact Beth Macey at maceyb2@rpi.edu, call (518)276-2031, or stop by JEC-2002.